The Cragside 10k is the second race in the Run Northumberland series and we thought that rather than turn up with just our cameras, we would have a run round to see what it was like from a competitors point of view. The first thing that you notice is that this isn't like any other 10k. 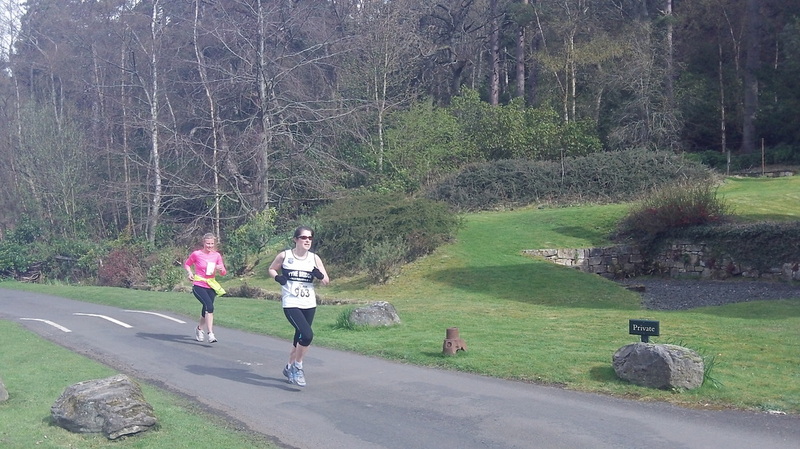 The course was set in the stunning surroundings of Cragside Hall with all amenities and facilities close at hand. The start was about 1k from the race HQ but this didn't cause a problem, it was actually a good way to warm up. We had only decided to do the race after the enjoyment of the North Tyneside 10k last week and missed the entry closing date so had to enter on the day. For this, we were charged an extra £5 on top of the already expensive £11 entry fee which was a little steep but the event was well organised and friendly so hopefully worth the money. The course itself was a killer! After a downhill start you climb. And climb. And climb. To be honest though, the hills didn't really bother us. No, you weren't going to get a fast time but so what, the course provided a challenge and a test of strength, endurance and pace judgment. We seem to live in a world where we are constantly chasing PBs so sometimes it's good to get away to a tougher course in picturesque surroundings, get stuck in and not worry about the stopwatch. Every time we reached the top of a hill we thought 'surely that's it' but round a corner and you were up again! The only thing that kept us going was the fact that we knew sooner or later that you HAD to come down and when you did, you REALLY did! At about 5 mile the course levels off then you start the long descent to the finish. You could really stretch out and let yourself go and the final half mile is a dream for those with a bit of leg speed. The differential between our fastest and slowest miles was more than 2 mins even though we maintained an eqaul level of effort throughout. The finish, as ever, was well organised with refreshments and changing readily available. The race itself was won by Morpeth's Michael Morris. 'Ironman' Morris led from the gun to back up his win at the first event of the series at the Wallington Half Marathon. His time of 33.40 was slower than you would expect from someone of his ability but like I said, this race isn't about times, its about hills and being tough! Michael told North East Runner "that was the hilliest road I've ever done! It was good to get another win on what was a beautiful course with a spectacular finish running down towards the lake. I'm looking forward to a flatter course at Bamburgh though'. Sunderland's Michelle Holt won the ladies event, dipping under 40 minutes with 39.40, half a minute ahead of Jarrow's Angela Hunter. So would we do it again? Would we recommend it to others? Well after paying £16 each and running a tough course we did expect at least a goodie bag with race tshirt..... As we entered on the day though, we were told that we weren't entitled to one, even though the event website says 'The entry fee for 2012 includes a goodie bag, T-shirt, energy drink and vouchers for other races'. A bit harsh? Possibly. Basically, our advice would be, in these tough economic times and if you a fan of having an event tshirt to show for your efforts, then make sure enter before the closing date. Overall though, an enjoyable day. Well done to everyone who got round a very challenging course. For pictures of the day visit our Picture Gallery. Please see below for a video clip of some of the day's racing. Want to tell us your racing story? Contact Us to let us know. Plan your summer racing with our up to date racing calendar. For details click here. See our advice page for tips on training, nutrition and injuries. Click here for more information. See how some of the region's top athletes train. Click here to read more.